Last week Houston’s literary community was buzzing. Houston writer Lacy Johnson was named a finalist for the National Book Critics Circle Award for her book The Other Side: A Memoir. 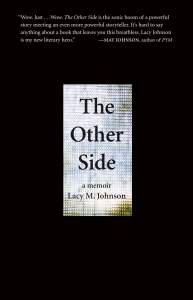 We are thrilled for Lacy who is an alum of the University of Houston Creative Writing Program and a former recipient of an Inprint Fondren Foundation Fellowship. Lacy now serves as University of Houston Cynthia Woods Mitchell Center for the Arts’ Director of Academic Initiatives. We asked Houston writer and University of Houston Creative Writing Program PhD candidate Austin Tremblay to share his thoughts about Lacy and her memoir with us. “I have something important to tell you” is a familiar lead-in, especially for writers. We might say this to fellow storytellers, friends, family, or the stranger two barstools down, and we might mean that we have good news, a severe warning, or an epiphany. What we will always mean, though, in spite of these variables, is that we have a story to tell. And we think you, storyteller, friend, family, stranger, should listen.